My friend asked me to do a birthday cake for her daughter who had just broken her wrist and was celebrating her 19th birthday. We figured that a cake that looked like an arm in a cast would be something she’d remember for a long time. Get well soon and happy birthday Liv! I did this cake for an annual fundraising dinner and auction for our local hospital. Everything on it is edible — a combination of gumpaste, fondant, royal icing, buttercream and of course, cake! A bit of everything went into the details of this cake. My favourite has to be the little dinner tray, complete with sliced turkey, peas and carrots, mashed potatoes with butter, a cup of coffee, a teeny muffin with icing and a banana. All from fondant. I hear it garnered a $500 winning bid at auction, with the funds going to the hospital. I’m tickled pink! I did this chocolate nurse’s scrubs cake for a fundraiser auction for our local hospital. The syringe and bandages were fondant; the stethoscope and scissors were gumpaste. I heard that it got a good penny at auction and that the buyer served it right at the fundraiser. Terrific! Last night, this cake I made was auctioned off as part of a huge fundraiser for our local hospital. I thought a cake based on the classic board game Operation would go along with the theme of a hospital fundraiser. The cake was huge! A carrot cake that could feed 40 people. I heard it got a good price at auction and was purchased by a doctor who took it back with her to the hospital the next day and shared it with hospital staff. Win win! This was so much fun! 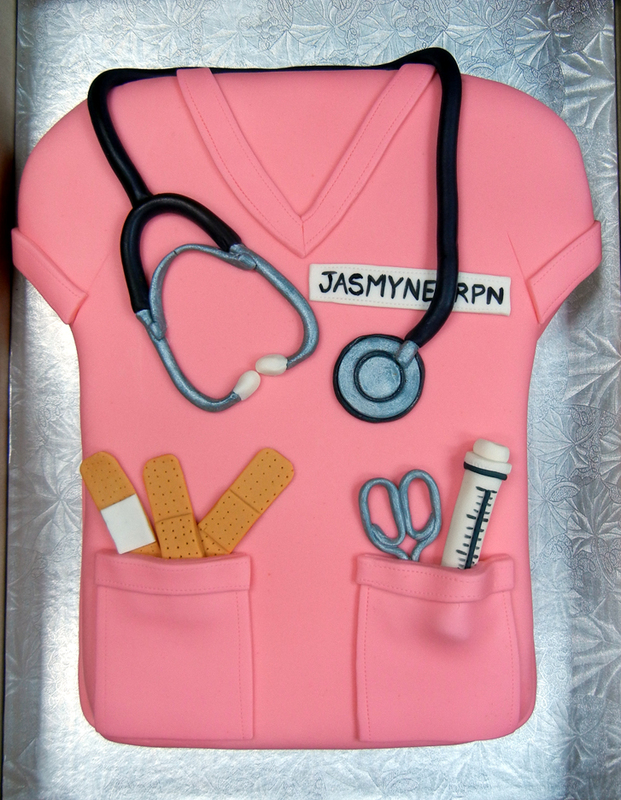 Stethoscope, scissors and needle are gumpaste, the rest is fondant. Love the pink scrubs! Best of luck to Jasmyne in her career!